Man, this is hard. I knew it would be and people warned me, but man, this is hard. Yesterday, we not only struggled to regain motivation from the long Labor Day weekend, but we ran out of M&Ms. We also had to be flexible and work around getting Gideon to and from his first day of pre-K. Our wonderful routine we grooved to so well last week was now all over the place. I tried to be creative and planned on hitting the library after dropping him off. But the library didn’t open for another 30 minutes. So what does the Goeke family do when we need to kill some time? (I’m noticing a theme here…we better be careful, or we are going to have to take the next year off to go through weight loss rehab.) And eating doughnuts is fine, but that 30 minutes could have been spent getting math done or something else. It just seemed like the day was wasted away. And when we returned home, all the binder work seemed overwhelming because there just wasn’t enough time left in the day to get it all done. The girls were understandably upset. I had a headache. I hadn’t had breakfast or lunch for that matter. And though I didn’t realize it at the time, I spent the whole day wearing my contacts flip-flopped in the wrong eyes. To top it off, workers were outside hammering away at the neighborhood street, keeping baby Judah from sleeping during his nap time, and the house seemed to be absorbing every degree of the 100+ temperature outside. I texted Paul at 1:50 as we left the house to get Gideon, “This is not working for me.” We had only made it through half of a folder the whole time he was gone to school. This was supposed to be our most productive time because he was going to be gone. After we made it home, Paul and I wrestled with the reality of our world. It seems like every free moment is planned and the pace at which we frantically run to complete those plans or meet with those people is unstoppable. There has got to be a way to do life differently! Or something is going to give… and it looks like it might either be my waistline or my blood pressure that pops first. Certainly Jesus did not need to sit down with his disciples or with his mother, Mary, and pull out his parchment scroll calendar and schedule in family time. Surely, he didn’t have to live by the “at least one evening at home” rule. He and his “family”- his disciples and all – went with him from city to city from lake to lake from crowd to crowd. When he tried to rest, he usually couldn’t. But, when he ate a meal, he reclined and lingered with every bite, investing in meaningful conversation with the people he loved at the same time. When his plans changed, he found a way to flexibly stretch and adapt. I think the difference between how Jesus “managed” His day, and how I “manage” mine is a matter of control. Jesus was GOD. G-O-D! And yet, He surrendered his earthly control over to the whisperings and ever-changing winds of the Holy Spirit. He relied on knowing that His Father was in control and working a bigger picture for the love of ALL his people, not just His Son. 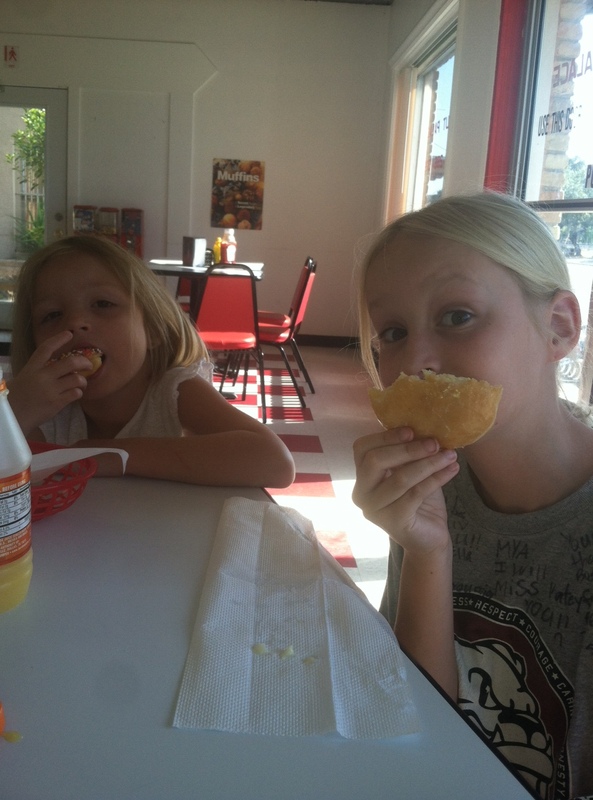 Man, if I worked from that knowledge and trust- that God is working for ALL his people, not just me and my plans, I might view having to waste an extra 30 minutes eating doughnuts, as gaining an extra 30 minutes of time with my girls talking. Or gaining an extra 30 minutes of time investing in the doughnut shop lady. (not just gaining a pound or two) If I listened to the urgings of the Spirit, even when those winds seemingly blow against the flow of my plan, I might end up in a bigger, deeper, and wider river of His blessing. Ugh…Man, I want to emotionally and spiritually “get it” through my thick-skinned heart, and hard-headed brain! So, after rationalizing putting some folders off until the next day, and giving the kids free-time to play, Paul and I talked and prayed. Our schedules have not lightened up, our home project list has not dwindled, and our clocks have not miraculously gained 4 more hours. 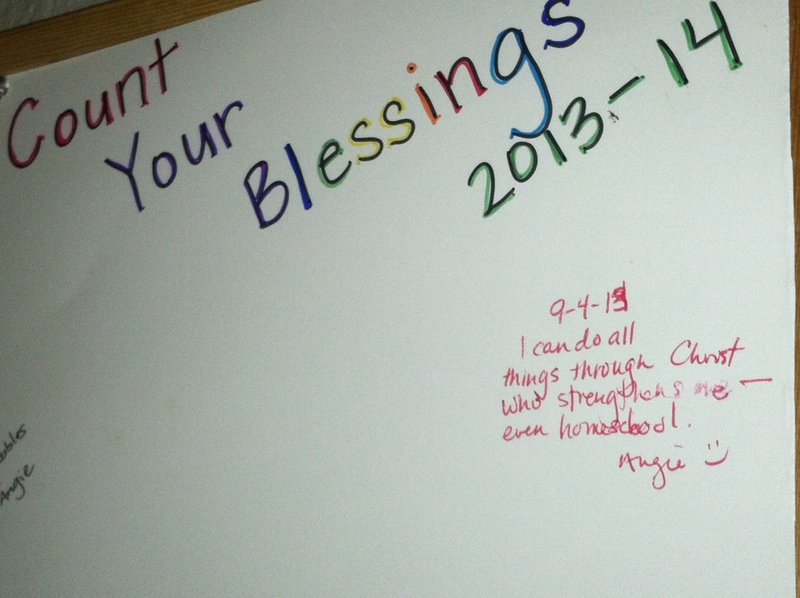 But what did happen was a something that went on our “Count Your Blessings” Chart. After the kids were in bed I went to put up our new bible verse for the week…which we all together skipped earlier that morning. See, I just have the location of the verses written in my planner. 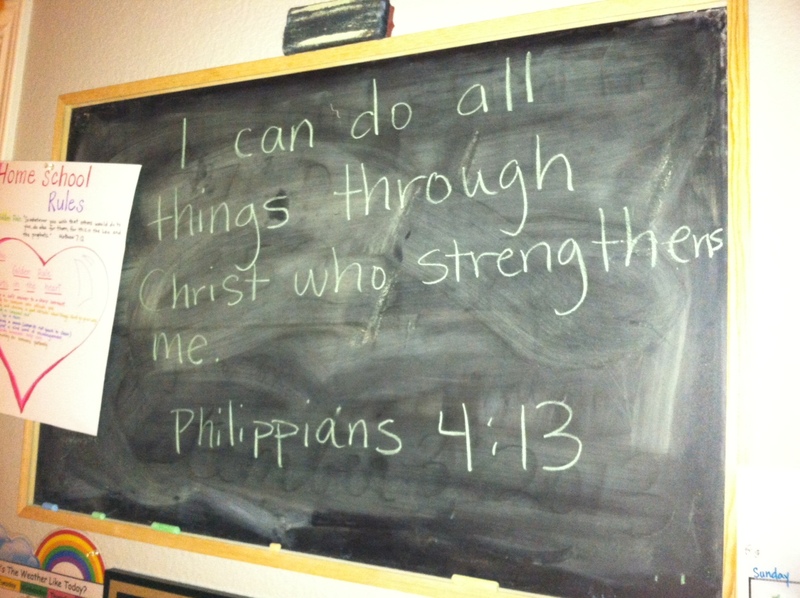 So I’m not always familiar with what the verse is until I look it up to write on the board. And when I saw the words that Jesus had for us that morning, that I didn’t even take the time to hear, I was humbled and grateful all at the same time. “I can do all things through Christ who strengthens me.” If only I had that on my heart and mind when the baby was crying and pulling on my hair in a hot house while the girls found every distraction possible to avoid doing their math. That was NOT what was on my mind…I really shouldn’t write what was on my mind. And so, I was reminded that Jesus does live in me, and that it is Him living in me that works out His strength in me. I may have missed it in the morning, but I was willing to take heed to it last night. I spent time being thankful for the change in plans. For seeing those moments as minutes gained, not lost. I found the strength (from Jesus) to make some monkey bread for the morning so as to allow for a slower more well-prepared pace and to make sure we made time for our bible study before anything else. Another blessing that seemed to come out of nowhere was that while the kids got ready for bed, I was able to fully prepare the school work for the next day, and Paul was able to do a long awaited and much needed household project. By 8:30, all the kids were in bed, our work was done, and we got a chance to talk and connect in good quality time. That hasn’t happened in a very long time. Somehow, our prayers from earlier were answered at least for that day. Our lives were not immediately transported to a deserted tropical island with no responsibilities or cares. (I did silently pray for that in my head.) Nor did we receive a million dollar check from Publisher’s Clearing House. But for those few hours yesterday, life slowed down and without much effort of our own. This morning, as the girls copied the verse from the chalk board to their notecards, I told them about my thoughts and feelings yesterday. How the crazy day made me feel like there was no way I could do homeschooling. And how this verse, even late at night after a day of discouragement, had been able to give me strength to make monkey bread. 🙂 And that today we can get more done with Jesus than we can plan to get done on our own. What we get done might look different, but if it’s done because the Spirit has lead us there and our hearts and actions have glorified God in the process, than it’s minutes gained, not lost.